How to securing or authenticating Node, Express and Mongoose REST API using Passport.js (Latest versions). This tutorial is about how to securing Node, Express and Mongoose REST API using Passport.js Authentication. In the previous tutorial we were talking about web authentication with Node, Express, Mongoose, and Passport.js, but today we are focusing on securing REST API only with a little different usage of Passport.js. 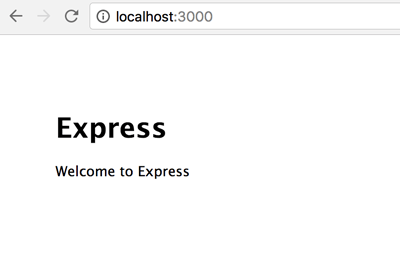 First, we have to install Express.js generator to make application development simple and quicker. Open terminal (OS X or Linux) or Node.js command line (Windows) then type this command. Now, create new Express.js starter application by type this command in your Node projects folder. That command tells express to generate a new Node.js application with the name "node-rest-auth". Go to the newly created project folder. Type this command to install default required Node dependencies. Now test your Express server by type this command. You will see this page if Express application generated properly. This time we have to install all required libraries and dependencies. Type this commands to install library and dependencies. We will make separate files for the configuration. For that, create the new folder on the root folder. Create a configuration file for Database and Passport.js. Open and edit "config/database.js" then add this lines of codes. This config holds database connection parameter and secret for generating JWT token. Open and edit "config/passport.js" then add this lines of codes. This config is use for getting user by matching JWT token with token get from the client. This configuration needs to create User model later. Now, open and edit "app.js" from the root of the project. Declare required library for initializing with the server by adding this lines of requires. Create a connection to MongoDB. Declare a variable for API route. To make this server CORS-ENABLE add this lines of codes. Initialize passport by add this line. Replace default landing page and route with this lines. We need to create User model for authentication and authorized data. Create models folder first on the root of the project. Open and edit "models/book.js" then add this lines of codes. Open and edit "models/user.js" then add this lines of codes. The different of User models are an additional function for creating an encrypted password using "Bcrypt" and function for compared encrypted password. Open and edit "routes/api.js" then declares all requires variables. Create router for signup or register the new user. Create router for login or sign-in. Create router for add new book that only accessible to authorized user. Create router for getting list of books that accessible for authorized user. Create function for parse authorization token from request headers. Finally, export router as a module. Now, it's time to run and test this secure REST API. Type this command to run the server. You will see this log in the terminal if the server runs correctly. We will test our secure REST API using Postman REST Client. You can install Postman for Chrome extension. Now, open Postman then enters method, address (http://localhost:3000/api/signup) and body parameters for create or signup new user. After click Send button and successfully created a new user, you should see this message. Next, we have to test if REST API for Book resource is restricted for the authorized user only. Change method to "GET" and API endpoint to "http://localhost:3000/api/book" then click Send button. You should see this message on the Postman result. To access the book resource, we have to log in using previously registered user. Change method to "POST" and endpoint to "http://localhost:3000/api/signin" then fill credentials like below screenshot. If a login is successful, we should get a JWT token like below. Just copy and paste the token value for use in request headers of restricted book resource. Now, do previous get book and add this header. If you see the blank array in response, then you are authorized to use book resources. Now, you can do the same thing for posting new book. That it's for now, sorry if this tutorial not perfect and too many incomplete words because we are writing this tutorial quicker. Any suggestion, critics or trouble report are welcome in the comments section at the bottom of this page. The full source code is on our Github.